National symbols inspire the elite of style and fashion, globally. The much celebrated House of Simon Rademan is proud to announce that Mr Rademan has been awarded the elite honour of becoming the official South African member of the first ever "International Designer Collection". This Symbol of Global Unity was hosted by the Prime Minister of New Zealand, Rt Hon John Key, and Style Pasifika, with 19 other countries, including… France, Canada, Japan, Argentina, England, Scotland, Romania, Ireland, Australia, US, Italy, Russia, Wales and New Zealand. 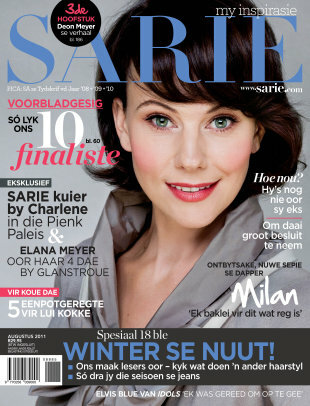 If you missed the South African exclusive of this prestigious global event in Sarie Magazine, read this. What inspired this? The national flag of the Republic of South Africa was adopted on Freedom Day, 27 April 1994, and first flown 10 May 1994 - the day Nelson Mandela was inaugurated as President. The central design of the flag, beginning at the flag-pole in a V form and flowing into a single horizontal band to the outer edge of the fly, can be interpreted as the convergence of diverse elements within South African society, taking the road ahead in unity. At the centre stands a shield signifying the protection of South Africans, above which are a spear and knobkierie. These assert the defence of peace rather than a posture of war. Within the shield are images of the Khoisan people, the first inhabitants of the land. The figures are derived from images on the Linton Stone, a world-famous example of South African rock art. The motto of the coat of arms - !ke e:/xarra//ke - is in the Khoisan language of the /Xam people, and means "diverse people unite", or "people who are different joining together". National orders are the highest awards that a country, through its President, bestows on its citizens and eminent foreign nationals. The President, as the fount of honour in the country, bestows these orders and decorations, assisted by the director-general in the Presidency, who is the chancellor of national orders. The Order of Luthuli is awarded to South Africans who have made a meaningful contribution to the struggle for democracy, human rights, nation-building, justice and peace, and conflict resolution. The Order of Ikhamanga is awarded for excellence in arts, culture, literature, music, journalism and sport. The country's national animal is the springbok, which also gives its name to the South African rugby team - fondly known as "the Boks". The springbok (Antidorcas marsupialis) gets its common name from its characteristic jumping display - pronk in Afrikaans. The animal stands 75cm high and weigh about 40kg. The national bird of South Africa is the blue crane (Anthropoides paradisia), the distribution of which is almost entirely restricted to the country. Standing about a metre tall, the bird is a light blue-grey, with a long neck supporting a rather bulbous head, long legs and elegant wing plumes which sweep to the ground. Blue cranes lay their eggs in the bare veld, often close to water. They are common in the Karoo, but are also seen in the grasslands of KwaZulu-Natal and the highveld, usually in pairs or small family parties. Although usually quiet, the blue crane can emit a distinctive high-pitched and rattling croak which can be heard from some distance. The South African National flower, the King Protea, has been renamed after former South African President, Nelson Mandela and is now called the "Protea Cynaroides Madiba". Simon Rademan has decided to draw inspiration from this for the First ever International Designer Collection of which he is the national representative. The giant or king protea (Protea cynaroides) is widely distributed in the south-western and southern areas of the Western Cape, from the Cedarberg up to just east of Grahamstown. South Africa's national flower is the largest of the proteas, which make up an important part of the Cape Floral Region, a major global biodiversity hotspot and a Unesco World Heritage site. The proteas also give their name to South Africa's national cricket team. South Africa's national fish is the galjoen (Dichistius capensis). The galjoen was chosen as the country's national fish because of its endemism - it is found along the coast from Namibia to Durban, and nowhere else in the world - fighting qualities, abundance and popularity. It keeps to mostly shallow water, is often found in rough surf, sometimes right next to the shore, and is known to anglers as a game fighter. Near rocks, the colour of the galjoen is almost completely black, while in sandy areas the colour is silver-bronze. The yellowwood family is ancient, having grown in this part of Africa for over 100-million years. The real yellowwood (Podocarpus latifolius), South Africa's national tree, is found from Table Mountain, along the southern and eastern Cape coast, in the ravines of the Drakensberg up to the Soutpansberg and the Blouberg in Limpopo. In forests, the trees can grow up to 40m in height with the base of the trunk sometimes up to 3m in diameter. But trees that grow in unsheltered places such as mountain slopes are often short, bushy and gnarled. The bark of the real yellowwood is khaki-coloured to grey when it is old, deeply split and peels off in strips. The crown is relatively small in relation to its height and is often covered with grey lichen. How many colours are there in our national flag? Name any of the emblems portrayed in our national coat of arms? What do you have to do to receive any of these awards? Is the Springbok really our national animal? How tall is the graceful Blue Crane? Where is this majestic flower found in South Africa? The base of its trunk can reach around 3m in diameter, but how high can it grow? Fashion has always been here. It is yours … IF you want it! These articles are protected by copyright: Simon Rademan Fashion Design Studio CC Media request for an interview Disclaimer: I do not proclaim to be an authority on any of the subjects I write about. I merely share my experiences with those who wish to learn from it, or just read about it. Please contact us should you have additional information or information that proves otherwise. I am not the designer of any of the gowns that are published on this page, nor have I made them, or photographed them, I, like so many others before and after me only draw inspiration from the beauty of life.